Please report to Legacy Oaks at your scheduled arrive time. You MUST have someone to drive you home. You may take blood pressure medication and other essential medications with a sip of water before coming to the procedure. Please hold any medication you must take with food, bring to your appointment and you may take after procedure is completed. If you are taking blood thinners, Coumadin, Heparin, Plavix, Lovenox, Aggrenox, you must stop this medication per the instructions given by Dr. Worrich. DO NOT STOP THIS MEDICATION UNTIL OUR OFFICE INSTRUCTS YOU TO DO SO. If you have been prescribed antibiotics please notify our office, as it may be necessary to reschedule your appointment. If you are diabetic, please monitor your blood glucose levels daily. Blood glucose levels above 200 may result in canceled procedure. If you are having a cervical (neck) or radiofrequency ablation (nerve burning) procedure, please do not wear jewelry to your appointment. Wear comfortable clothing and low-heeled shoes. If you are late, your appointment may be delayed or rescheduled according to the doctor's schedule. Your procedure will be preformed in one of our procedure rooms. If you desire IV Conscious Sedation, you will have an intravenous infusion started. Your blood pressure, pulse and respiration will be monitored. Your doctor will order your sedation to help reduce any discomfort and anxiety you may have. You will not be given general anesthetic. The doctor will determine what position he will perform your procedure. The doctor will give you a local anesthetic at the injection site. 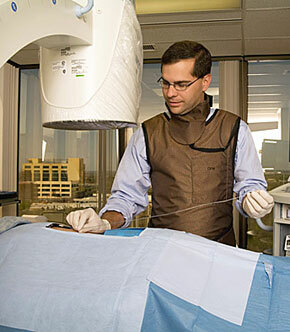 Your procedure can last from 15 to 60 minutes depending on the procedure. Pain relief is variable. It may occur immediately or it may take several days for the procedure to be effective. In addition, you may experience soreness from the procedure for a few days. It must be understood that some medications take several days to affect the pain. You will remain in the Recovery Room approximately 30-60 minutes after your procedure, depending on if you have sedation. You will continue to be monitored, which will include blood pressure, pulse and respiration while in the Recovery Room. You will be offered liquids at this time. You will note some drainage from the site, this is normal. You may experience increased pain and soreness at the injection site 48 hours after the procedure. Some side effects may occur and the nursing staff will go over these with you prior to discharge. The doctor will tell you at the time of discharge when to follow-up. You must also follow the doctor’s instructions on taking medication prescribed to you, if any. You must understand that taking medication prescribed to you is an important part of your pain management care. I’ve had an interventional pain procedure with a CPM physician. What's next? You will be given post-operative instructions following your procedure(s). Read them and follow them carefully. Please make a follow-up office appointment for 2 weeks after your LAST procedure (sometimes procedures are booked in a series) by calling (210) 546-1480.